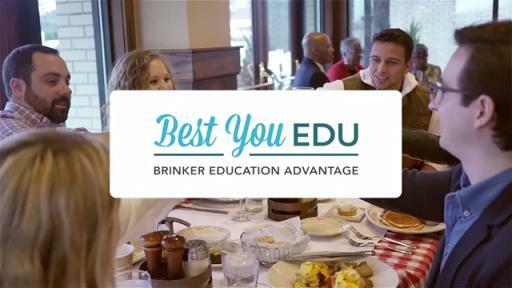 DALLAS, Jan. 22, 2018 – Brinker International, Inc. (NYSE: EAT), one of the world’s leading casual dining restaurant companies and owner of Chili’s® Grill & Bar and Maggiano’s Little Italy®, announced today the launch of a comprehensive educational program, Best You EDU. In partnership with Pearson, Best You EDU is an employer-education program that provides opportunities for Brinker Team Members, ranging from hourly to management. At absolutely no cost to participants, Best You EDU is open to all Team Members who work at least 24 hours per week with a minimum tenure of 90 days and registration is now open. “We already work for a company that has the drive to make our lives better. So, to see that they are taking more steps to help us achieve a more purposeful life is amazing to hear,” said Katie McGee, Assistant Manager at Chili’s. “I would be one of many who would greatly appreciate and be grateful for working and being a part of a company that supports free education. That to me means that not only select individuals have an opportunity to succeed, but now that opportunity is available to all,” said Victoria Castillo, host at Chili’s. “I’m excited to hear conversations among Teammates evolve to include ‘and how are your classes going?’ because the goal is to help each individual achieve their very best. And, to make that happen with no financial burden to our Teammates is the right way to do it,” said Brooke Burgiel, PeopleWorks Director at Maggiano’s. Brinker International, Inc. is one of the world’s leading casual dining restaurant companies. Founded in 1975 and based in Dallas, Texas, as of the fiscal first quarter ended Sept. 27, 2017, Brinker owned, operated or franchised 1,682 restaurants under the names Chili's® Grill & Bar (1,630 restaurants) and Maggiano's Little Italy® (52 restaurants).